Images returned from NASA's Cassini spacecraft have yielded evidence that the geologically young south polar region of Saturn's icy moon Enceladus may possess reservoirs of near-surface liquid water that erupt to form geysers of the kind found in Yellowstone National Park. This finding and others are being reported today by the Cassini Imaging Science Team in the journal Science. "We realize that this is a radical conclusion - that we may have evidence for liquid water within a body so small and so cold," said Dr. Carolyn Porco, Cassini imaging team leader at the Space Science Institute in Boulder, Colo., and the lead author of the Science report. "However, if we are right, we have significantly broadened the diversity of solar system environments where we might possibly have conditions suitable for living organisms. It doesn't get any more exciting than this." 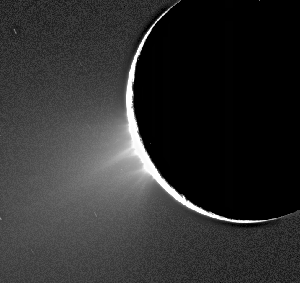 High resolution Cassini images showing the icy jets, and the towering plume they create, reveal the abundance of the constituent particles and the speed at which they are being ejected from Enceladus. These results indicate that there are far too many particles being released from the south pole of Enceladus for the source to be merely frozen mist condensing out of a plume of water vapor, or particles that have been blown off Enceladus by jets of water vapor arising from warm ice. Instead, they have found a much more exciting possibility: the jets may be erupting from near-surface pockets of liquid water above 0 degrees Celsius (32 degrees Fahrenheit), like cold versions of the Old Faithful geyser in Yellowstone. 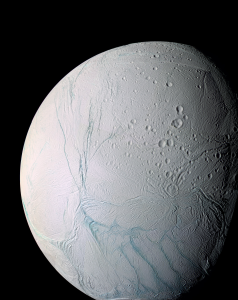 "There are other moons in the solar system that have liquid water oceans covered by kilometers of icy crust," said Dr. Andrew Ingersoll, an atmospheric scientist and a co-author on the paper in Science. "What's different here is that pockets of liquid water may be no more than ten meters below the surface." In the near-vacuum conditions at the moon's surface, liquid water would boil away into space, erupting forcefully into the void and carrying particles of ice and liquid water along with the vapor. Analysis of the jets and plumes indicate that most of the particles eventually fall back to the surface, giving the moon's south pole its extremely bright veneer. Those that escape the moon's gravity go into orbit around Saturn, forming the E ring. Cassini images have revealed the geology of Enceladus in startling detail, including relaxed craters and extensive surface cracks and folds. Imaging scientists report that the moon has undergone geologic activity over the last four and half billion years up to the present, with the active south pole being the only place where liquid water may currently exists near the surface. Telltale geologic features throughout the southern hemisphere of Enceladus also point to a change in the body's shape with time. Scientists believe these to be related to an episode of intense heating in the moon's past that may, in turn, explain the anomalous warmth and current activity in the south polar region. The sources of this warmth are a major puzzle. Some combination of tidal flexing and heating of the interior by naturally radioactive material may provide the heat to power the geysers, which almost certainly erupt from the narrow, warm fractures, called 'tiger stripes,' seen crossing Enceladus' south polar region. However, obtaining enough energy to reproduce the observed heat emanating from the south pole is still a problem. Dr. Torrence Johnson, a satellite expert at NASA's Jet Propulsion Laboratory, Pasadena, Calif., and a co-author, notes: "Active water geysers on little Enceladus are a major surprise. We're still puzzled about the details and energy sources, but what's exciting is that Enceladus obviously figured out how to do it. Now it's up to us to crack the mystery." Images accompanying this release are available at http://ciclops.org, http://saturn.jpl.nasa.gov and http://www.nasa.gov/cassini.